Have you ever thought about trapping armadillos? Chances are you have....especially if they are digging up your yard, flower bed or garden. 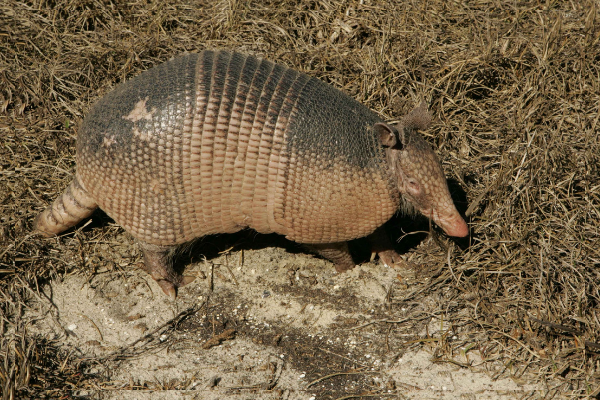 The armadillo has became a notorious problem for many people living in the southeast portion of the United States. They originally moved into Texas from Mexico and their range has been expanding since 1850. Since armadillos are sensitive to cold environments, you won't find them in the northern part of the United States but for those who live in a warmer southern climate, the armadillo can be a major pest. Although they're only about as big as a domestic house cat or opossum, these little animals can do a lot of damage in one night. Armadillos eat grubs, worms and insects which all commonly live underground. To reach the food the armadillo uses its sharp claws to dig holes searching for its food. The results.......a yard full of holes and destruction. An armadillo track has three toe prints with sharp claw marks. Although it's possible to see an armadillo during the daylight, they're mainly nocturnal and come out at night. The nine-banded armadillo gets the name from its nine bands of boney armor. It also has rings of armor that protects its long tail. The animals are known as being clumsy with poor eyesight and somewhat oblivious to what is going on around them. Have you ever wondered why you see so many armadillos dead along the roadway? There's a couple of reasons. First, they are nocturnal so it's harder for motorists to see them at night until it's to late. Second, when the animal is scared or startled its response is to jump up in the air. Jumping up into the path of an oncoming car is usually fatal. As the animal digs for food they leave behind several shallow holes which are about 3-5 inches wide. The animal also digs a burrow in the ground and several smaller dens that they use for potential escape. The burrows are commonly found under barns, garages and homes and they can potentially cause damage to the foundation of the structure. 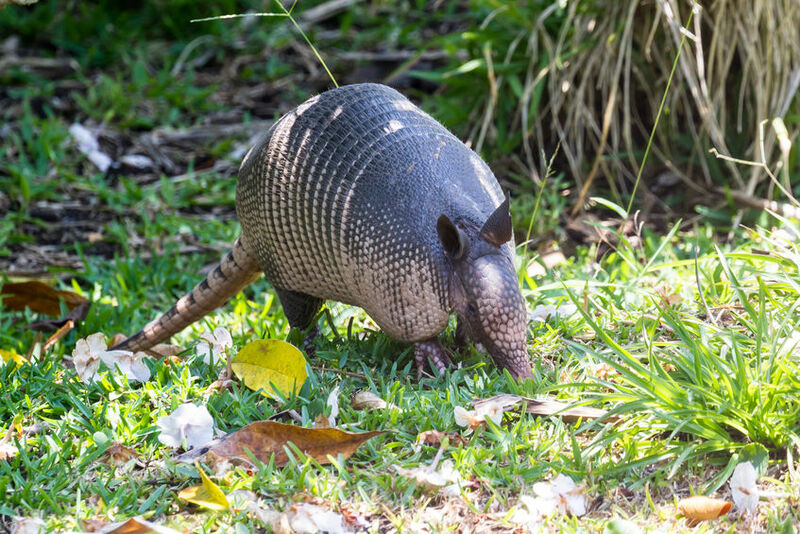 Sturdy Fence - A strong and sturdy fence can be used to keep armadillos out of your yard but since they are burrowing animals a portion of the fence should be buried underground to prevent the animal from just digging under it. Scents - Armadillos are known for having a very sensitive nose. Strong odors like ammonia, moth balls or even vinegar have been used to drive the animal away. The results have mixed reviews. One of the best ways to eliminate an armadillo problem is by trapping them. A live animal trap works best. Choose a trap that's roughly 12 x 10 x 30. Any similar sized trap will work just as long as it's big enough to hold a raccoon or house cat. Havahart produces a great high quality trap that works well. A two door or single door model will work. You can choose to bait the trap with a nylon stocking filled with worms but that's not the best way for trapping armadillos. The best way is to simply funnel the animal into an un-baited trap. If you're having an armadillo problem, look for runways that the animal has been using. They typically follow edges and consistently use the same path. Also look for burrows. Setting a live animal trap in the pathway leading into or out of a burrow works great for trapping armadillos. An armadillo will typically have one single nesting burrow and several smaller escape burrows. Locating the predominant nesting burrow is best but the others will work. To increase your odds of trapping the animal, use long boards on each side of the live animal trap to funnel the animal inside. If your trap is slightly out of place the boards will guide the armadillo into the trap. If you find a runway going along a building, set your trap tight against the building and use a board or fence on the other side of the trap to prevent the animal from walking around it. That's really all you have to do to be successful at trapping armadillos. No bait is necessary. In fact, if you use bait chances are you will just trap a raccoon, feral cat or skunk. To increase your odds, make sure the trap is setting flat on the ground and does not rock back and forth when the animal walks in. Try keeping the trap free from unwanted scents and check it early in the morning since the animal was probably trapped sometime throughout the night. Before you relocate or euthanize the armadillo check with your local laws and regulations to see what is acceptable. If you choose to relocate the animal, take it at least 5 miles from your home and release it into an environment that's suitable for the animal. A wooded or brushy area near a water source is ideal. When releasing the animal make sure you are not releasing it near other houses or structures. You don't want to take your problem armadillo and pass it on to someone else. You can also euthanize the animal if you feel comfortable doing so and local laws allow it. If you follow the steps listed above, trapping an armadillo is not difficult and you can do it yourself without the help of an expensive exterminator. 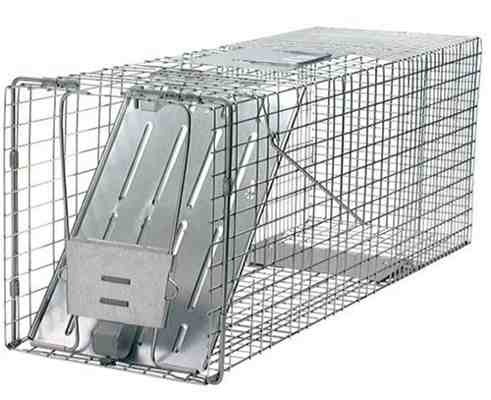 With a simple live animal trap and a little practice you can eliminate those destructive animals from your lawn or garden.